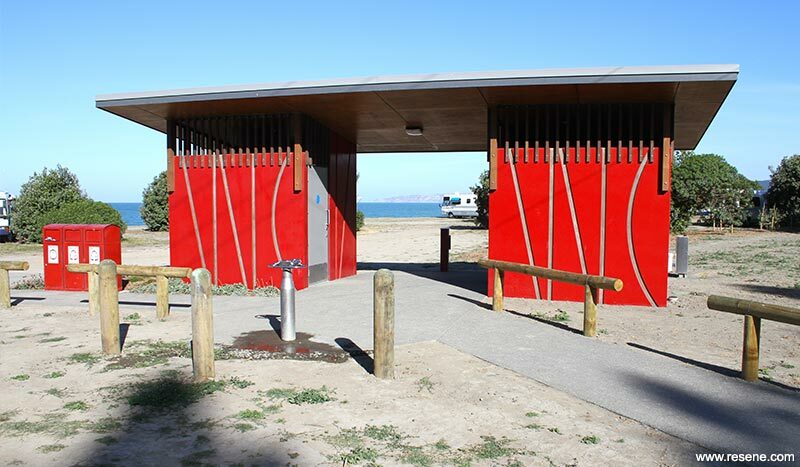 Set between the coastal road, iWay cycle path and the sea, these new Haumoana Public Toilets service coastal walkers and cyclists together with the overnight freedom campers that park in the reserve. Designed for the Hastings District Council it replaces an old and dark public toilet facility that originally serviced the reserve. Robustness and practicality dictated the choice of precast concrete panels for the walls with a roof floated above with gapped timber battens between these elements. This allows air and light to freely enter the building so that the sounds and smell of the coast can be experienced inside and to avoid the need for mechanical ventilation and to reduce the requirement for artificial lighting. 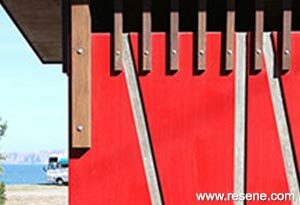 The site is both coastal and rural with the kiwi rural red shed referenced in both form and colour. The toilet ‘cubicles’ are split with a covered area between, to break the visual bulk, to provide shelter and to frame a view of Cape Kidnappers. While the concrete walls address durability they do not solve maintenance issues with regard to graffiti. Being a public toilet probably the most important consideration in design is robustness and an ability to detract vandalism but when the inevitable happens, that graffiti can be removed without damage. Concrete panels were painted with two coats of pigmented Resene Uracryl with a finishing coat of clear Resene Uracryl GraffitiShield. The recesses were simply coated in the clear Resene Uracryl GraffitiShield. Above the solid colour of the concrete walls is natural timber. Stained tonka hardwood battens sitting between the walls and plywood soffit provide a delicate lattice of contrasting light and shade. 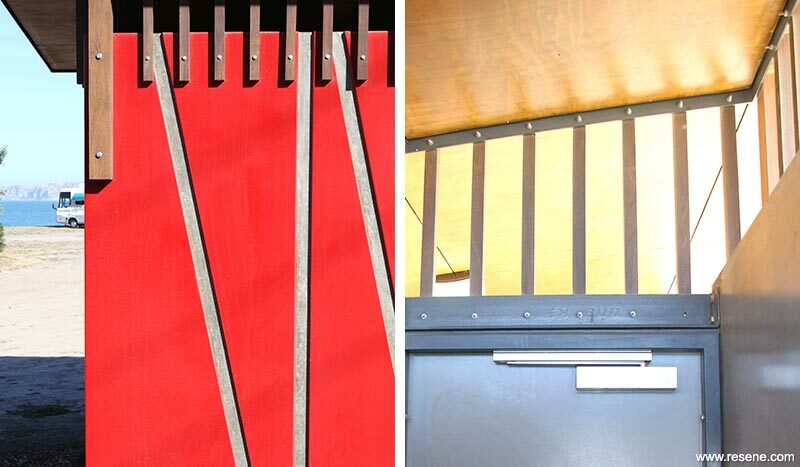 The plywood soffit is stained too, with Resene Colorwood stain overcoated in clear Resene Uracryl GraffitiShield, allowing the pattern of the grain to be seen. The exposed timber battens and posts supporting the roof are tonka timber, which is extremely dense. 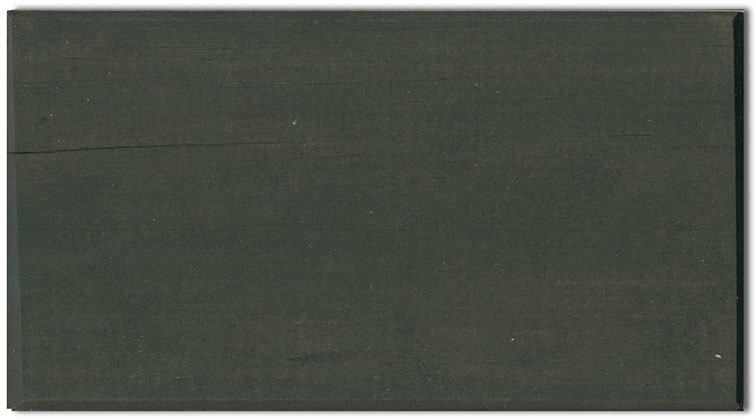 This was stained with Resene Waterborne Woodsman Shadow Match (brown black), which ends up a rich brown with the density of the timber and of similar intensity to the Resene Ironbark (brown) stain on the ply soffit. This is ‘big’ landscape, experienced accelerating up to 100 kms per hour after leaving the township or approaching it head down on a bike aiming for the end of the straight. To be seen in this context the colour needed to be big too, to be in sharp contrast to the dull greens of the trees and the expansive blue sky. It was no place for delicate multi-hued schemes. It needed to be bold and graphic. Resene Hot Chile (burgundy red) achieved this. The graphic nature of Resene Hot Chile is reinforced with the introduction of the clear coated recesses; themselves a slight abstraction of the letters WC. The intense red acts as a route sign, inviting a stop for a comfort break, a drink and a chance to lift your head and admire the view. The intensity of the red makes the blue sky appear more intense too. 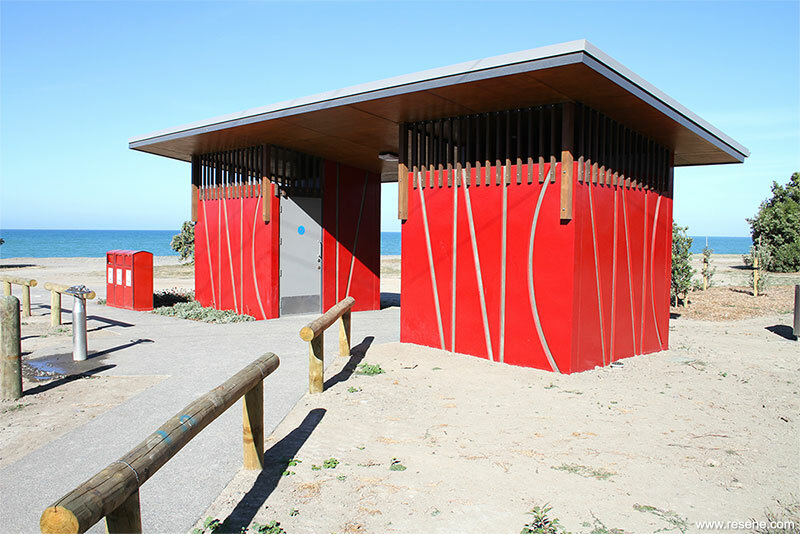 This project won the Resene Total Colour Maestro Commercial Exterior Award and the judges commented “as if dug into the sand like a sandcastle, this red explosion of colour on a beachfront is unique; there simply wouldn’t be another colour like it around. The colour is used to be seen as big, to be in sharp contrast to the dull greens of the trees and the expansive blue sky. The intense red acts as a route sign, inviting a stop for a comfort break, a drink and a chance to lift your head and admire the view. Colour is used to make the blue sky appear even more intense and to highlight the natural environment surrounding.